Lusting after every single pant shown here is from the J.Crew Collection! 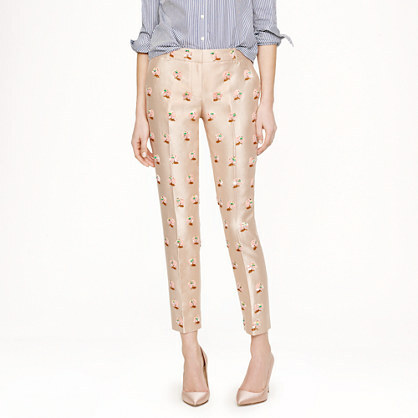 Might I add they are all super pricey but the colors and prints on these J.Crew pants are too amazing! If there's anything I've learned this summer, it's that printed cropped pants look the best on my legs. I've always recommended a cropped pant to all my girl friends. It's been the choice of cut in leg wear for over 2 years now. I advocate to everyone to try on a crop pair, printed or non-printed. Different retailers have different sizing and fits, so the more you experiment the better. If you don't love it on yourself, try on the next thing. It's all about finding what looks fabulous on you. And when you do find that fabulous piece that you are obsessed with, I say the more the merrier. Don't just buy one, buy the same piece in a different color or print! Seriously! When something is so great on your body type and you feel comfortable in it, then it is most definitely acceptable to buy in multiples! Trust me on this. It's a new mantra I live by, whether it be shoes, tops or pants. The retailers I go to for cropped pants are H&M, Gap and Zara. Remember, experiment! It's the only way to find your true style! If I ever get around to affording one of these pairs, I'll let ya'll know!